CLEVELAND — Krylon® continues to lead the way in innovation, as the quality and convenience of Krylon Fusion for Plastic® spray paint is now available in a brush-on formula – the only such paint offered to consumers. With just a stroke of a brush, Krylon Fusion for Plastic and your imagination, you can give plastic surfaces a facelift. In fact, Krylon Fusion for Plastic is a favorite of crafters and DIYers everywhere looking to rejuvenate plastic surfaces of all kinds. “Krylon Fusion for Plastic spray paint has gained wide popularity among do-it-yourselfers for use on an array of home accessory projects,” said Denise Patterson, Krylon product manager. “For example, it’s ideal for many projects, including window blinds, vases, picture frames, lamps, wastebaskets, tissue boxes and more. Based on additional research, it was determined there is a need for a brush-on version for slightly larger projects. These might include projects such as sprucing up faded plastic patio furniture, children’s toys and clubhouses; to freshening up plastic fences, mailboxes, shutters, planters and storage containers. The easy-to-use, one-step, super-bonding brush-on paint requires no sanding or priming and can be used on most plastics, as well as a wide range of surfaces, including wood, PVC, resin, ceramic, glass, tile, metal, wicker and other hard-to-bond surfaces. Additionally, eco-conscious consumers appreciate Krylon Fusion for Plastic brush-on and spray paint because both encourage plastic reuse, helping to reduce the amount of plastic products going into landfills. Krylon Fusion for Plastic brush-on paint is offered in a semi-gloss finish in an assortment of eight shades ranging from neutrals to bold, energetic brights. They include: White, Black, Red Pepper, Sunbeam, Espresso, Patriotic Blue, Hunter Green and Khaki. 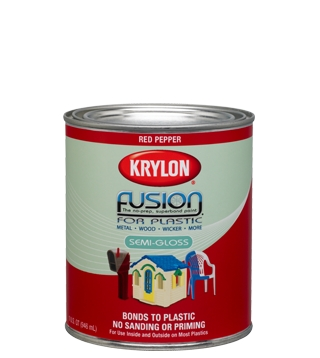 Suggested retail price for one quart of Krylon Fusion for Plastic brush-on paint is $8.99 to $10.99. It is available at local hardware, home centers and craft stores. For those who prefer to spray on, Fusion for Plastic spray paint is offered in a clear coat, specialty finishes such as hammered, textured and metallic, as well as more than 35 colors – all featuring Krylon's exclusive EZ Touch 360°® Dial Spray Tip for more comfortable, accurate spraying. Also available at local hardware, home centers and craft stores, the suggested retail price for a 12-ounce can of Krylon Fusion for Plastic spray paint is $3.99 to $5.99. All Krylon paints are compliant with the California Clean Air Act for Aerosol Coatings and the California Low Emissions and Reactivity Rule (CLEAR). For inspiration and more home improvement hints, visit the Krylon website at www.krylon.com. Krylon, the nation’s leading spray paint manufacturer, is number one in color, innovation, and inspiration and consumer brand recognition. The Krylon consumer products line includes a wide selection of paints and paint-related products, from general-purpose paints to specialty products to rust-preventative paints and primers.